I have a confession to start this review. I have weird, tiny ears. I am definitely the edge case for any earphones regarding fit, so anything moving forward should be taken with a grain of salt. In this context, the Sennheiser MM70s were some of the best fitting earphones I have tried. These earphones come with five different sized sleeves, and I could get a decent fit but not necessarily a good seal in the ear canal. This became especially problematic at the gym, because with a little perspiration they were falling out of my ears. Again, I think for the average users you will find the fit to be more than satisfactory. MM70s’ construction is solid and sturdy, the design is simple and understated. The rubber-ish cord also made for quick winding and not a lot of tangling. The other part that helps with fewer tangles as well as extended life is the included winder, which comes with two nested areas for the actual earbuds, a very welcome inclusion. The headphone package also comes with an adapter for additional phones, shirt clip, and a leatherette pouch to keep everything together and tidy. In all, you should have everything you need to use these earphones in any occasion. The cord is asymmetrical so the controls are closer to your left ear than the right. This seems to be another design choice for keeping those cords from winding upon themselves. The inline controls come with a volume slider, a play/pause/answer button, and microphone. The placement on the controls is a little tight and makes for accidental volume tweaks when trying to use the control button to stop or start music or answer a call. The microphone is capable of carrying on conversations clearly, even in noisy environments. I did sometimes find I was repeating myself on some calls, I would say that overall the voice situation is more than acceptable but there can be some clarity issues. I was not able to figure out what the exact issue was so other factors beside the earphones could have contributed to lack of clarity. The true criteria is how do they sound. The verdict is MM70s has a crisp, clear sound, perhaps a little midrange-y. There is no artificial low end boost that you find in many current earphones. This neutrality took some getting used to as I had become conditioned to the bass heaviness of my previous earphones; listening to dance and hip hop sounded a little thin during initial tests. These are great earphones for classical and jazz, although when listening to a recording of Beethoven piano sonatas I felt that the midrange was pushing to the higher end and leaving off some of the low end. 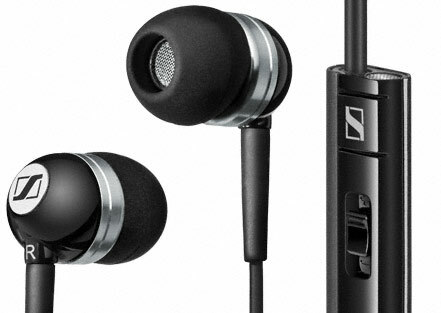 Listed at $99.95, Sennheiser MM70s has a great value for the price. I haven’t seen many earphones in this price range that give this quality of sound with a excellent construction and full featured accessories.